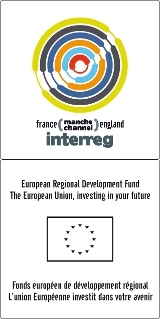 With a budget of 173.5 million Euros, the INTERREG IVA France (Channel) – England programme is a European programme which aims to "favour the emergence between the French and English parties of a common citizenship area, of a feeling of belonging to a cross-border area, of a specific identity, by supporting concrete and sustainable co-operation that are set in a triple focus involving innovation and competitiveness, social cohesion, and sustainable development”. Projects applying for a grant must meet the criteria of one of these priorities. For instance, the CAMIS project meets the criteria of the Priority 1. Besides, projects must involve at least one partner from each side of the Channel, in the area mentioned below. The project must demonstrate a high level of cooperation between partners: joint development, joint implementation, joint staff, joint funding. For each project, partners shall appoint a single lead partner to be the project's administrative leader, and shall sign a contract of partnership.